The collect and readings for The Feast of All Saints may be found here. The following sermon is based on the beatitudes, Matthew 5:1-12. 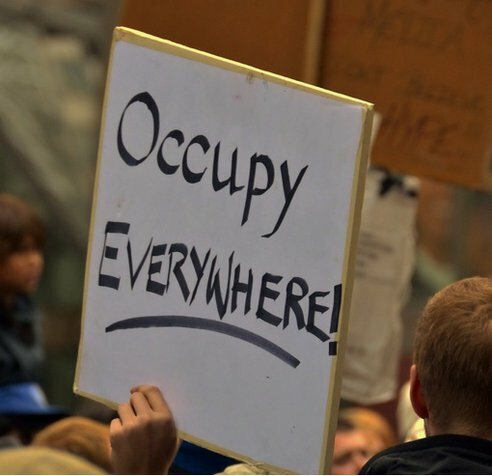 The Occupy Movement has gotten a lot of attention over the last couple of months. Occupy Wall Street. Occupy London. Occupy Sydney. Occupy Oakland, Portland, Dallas, San Antonio. The list goes on and on. The movement points to economic inequality, corporate greed and wrongdoing, the need for jobs. The movement rightly identifies places of injustice, places where change is needed. I share their concerns. They are right to speak out. We need to hear and pay attention. I wonder, though, whether much will change or can change. The movement to occupy is not really new. It has been the way of humanity from the beginning. Adam and Eve wanted to occupy the garden. Egypt wanted to occupy Israel. Israel wanted to occupy the promised land. Rome wanted to occupy the Jews. The Pharisees and Herodians wanted to occupy Jesus. The desire to occupy has never ended. It lay at the heart of the Arab Spring and the violence and abuse to which it was responding. It is often an unspoken reason for our wars. It is one thing that is held in common by the conservatives and liberals of the Episcopal Church. It is what keeps the two party system of Democrats and Republicans campaigning and debating. The struggle to occupy is not just limited to national or global issues. It is also personal and local. Each one of us could probably describe the ways in which we have tried to occupy situations, places, even people. It’s in our marriages, our business disputes, our local communities and organizations. We learn to occupy at a young age. Watch two kids arguing over a toy and you will see the struggle to occupy. Wherever you find conflict, violence, or brokenness you are also likely to find the struggle to occupy. Everyone wants to occupy but not many want to be occupied. Before one can be trusted to occupy, however, one must first be occupied. That is, perhaps, what sets apart the saints; why their lives are worth studying, their words worth reading, their example worth emulating. Think of Mother Theresa in the streets of Calcutta. Remember the Episcopal seminarian, Jonathan Daniels, dying in the place of a young black girl during the civil rights movement. Recall the Catholic Archbishop Oscar Romero assassinated for his work and words in El Salvador. Go read about Archbishop Desmond Tutu working for reconciliation in South Africa. Each one was willing to be occupied by a life other than their own and values greater than the ones of their own time and place. That’s the way of saints and the way of discipleship. That’s why I am not convinced the Occupy Movement will be able to change much. Both sides are occupying from the same set of values: power, control, security, opportunity, wealth. They are trying to occupy the same space. The rich have taken from the poor so now the poor will take back from the rich. The score may change but the game goes on and on. We cannot overcome evil by fighting it head on, on it’s own terms, but by transcending it. Until we move to a different place, a different perspective, a different way of being we will continue to do the same thing over and over. Despite our best intentions we’ll continue to get the same results we always have. This is true in our families, our schools, our churches, our county, our world. The only thing that will change is who occupies. Reallocation is not enough. Christ did not come to simply redistribute resources but to demonstrate, teach, and call us to a new way of being. We do not need another new way of doing the same old thing. We need to learn how to be different. The new way does not begin in an economic or political system, but in the human heart. That is, I think, why St. Antony moved to the desert, St. Francis renounced his father’s wealth, and St. Julian of Norwich locked herself in a life of prayer. They wanted a new way. Throughout the ages the saints have echoed Christ’s call to a new level of being and living. Einstein is attributed with saying, “No problem can solved by the same level of consciousness that created it.” Remember the kids and the toy? Until they can rise to a consciousness of sharing, the bickering back and forth will continue. Before Einstein ever said his words, however, Jesus understood, lived, and demonstrated them. That’s why he took the disciples “up the mountain,” the place that reaches toward heaven. It is the invitation to life in the kingdom. Going up the mountain is more about an interior movement than a geographical one. Jesus was raising the disciples’ perspective, giving them a different view, offering a larger vision. He took them to a new level of being. There he taught them to be occupied by poverty in spirit, mourning, meekness, hunger and thirst for righteousness, mercy, purity in heart, peace making, and the willingness to be persecuted for the righteousness of Jesus himself. That’s a hard way of being. It is about surrender rather than control, vulnerability rather than risk, searching rather than satisfaction. It is the way of Christ. Jesus knows and has shown us that this new way of being heals the human heart, transforms lives, and reveals the blessing of God. The beatitudes are not a to do list, eight helpful hints for happy living, or utopian ideals. They are Jesus’ core values. They define Jesus’ life and ministry. They are at the heart of his teaching, his healing, his life and death. Jesus is not telling us what to do but how to be. The world does not need smarter, harder working, more beautiful, busier, or more successful people. The world needs “beatitudinal” people, occupied people, who speak, act, pray, and relate from the level of kingdom consciousness. That is who the saints of every age are. It is who we are to become. The saints are not God’s little overachievers. They are ordinary people who allowed themselves to be occupied by the life of Christ and his values. If the Feast of All Saints is about remembering, honoring, and learning from the saints then it is also about examining our own lives. Where and how do the beatitudes shape our lives? How do our lives manifest the beatitudes? In every relationship, place, and circumstance we must answer this question: Do we occupy or do we allow ourselves to be occupied? Power and headlines may come by occupying but life and blessings come by being occupied. As always, this sermon is full of wisdom and grace. Thank you Brother James. I hope I have the wisdom and grace to more fully live my words. Always good to hear from you. Thanks for reading my blog. Thanks for another great post! You really pulled away some veils from this issue any get to the heart of the story. I always look forward to reading your posts. God’s Peace. Ian, I am glad you like the post. Thanks so much for your encouragement.